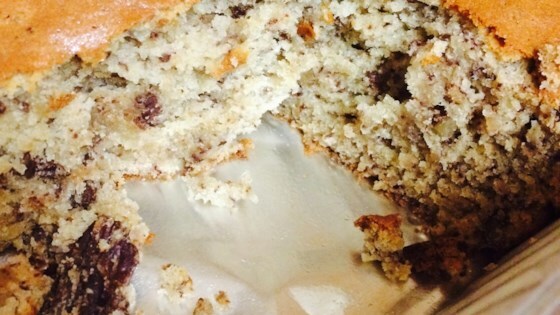 "A simple vanilla cake with swirls of coffee topped off with cinnamon sugar. An excellent tea time treat." Sift the flour, baking powder, and salt into a large bowl. Use and electric mixer to beat the butter and sugar in a separate large bowl until light and fluffy. One at a time, beat the eggs into the butter mixture. Beat in 1/2 of the flour mixture, the milk, and the remaining flour. Mix well after each addition. Stir in vanilla extract. Transfer about 1/3 of the batter to a small bowl. Dissolve the instant coffee granules in 2 tablespoons of boiling water. Stir the coffee liquid into the small bowl of batter. Spoon 1/2 of the vanilla batter into the prepared baking pan, top with the coffee batter. Spoon the remaining vanilla batter over the coffee layer. Use a butter knife to gently swirl the batters together. Bake in the preheated oven until a toothpick inserted in the center comes out clean, 35 to 40 minutes. Cool on wire rack for 30 minutes. Dust cooled cake with cinnamon sugar. I made this during a family party and everyone loved it! But I changed instead of the coffee on the top, i add a cup of coffee to the rest of the batter. Good recipe. I followed it exactly and thought it was really flavorful. I topped mine with a coffee glaze which really made it full of coffee flavor! Good, light flavor. I followed the recipe as written and was happy with the results.